Kristina is at present fourteen years old. She and her family are living in Perrenjas, but she started to attend the school in Kotodesh. Kristina uses the minibus to come to school but she also has some family living in Kotodesh and at times she lives in their home too. Kristina attends the eighth grade at school. 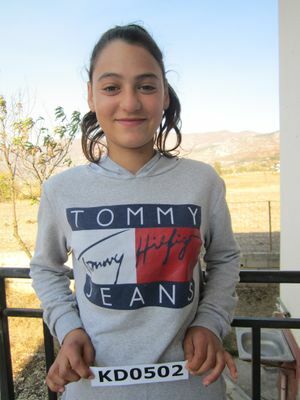 Her favorite subject is physical education and her future dream is to be a coach or teach this subject. Her hobbies are sports. She also likes to be an actor. Her favorite color is red. Kristina attends twice a week, every Tuesday and Friday our feeding programme at Kotodesh, enjoying the combined meals cooked and served to the participating children. She likes the fried chicken, sausages, pasta and rice served by our cooks. Kristina attends the Bible classes for the children who are same age with her and enjoys singing to praise the Lord Jesus and learning from God’s Word. At the end of the Bible lesson, she and the other children spend time to play at our feeding centre under the care of our teachers. Kristina once a year has the possibility to have a free dental care offered by our dentist. Kristina has her father, mother, a brother and a sister. Her father is invalid. He has problems walking as well as with his sight. Being is such condition he is unable to work and is receiving an invalid pension. Kristina’s mother is carrying for him during the day besides the housekeeping. She is jobless and the amount received in this family is way too less to support the living expenses. When Kristina gets freed from her studies, she also helps her mother with the housekeeping.